Youth pilgrims must be between the ages of 15 (or coming to the end of year 10) and 21 at the time of travel. 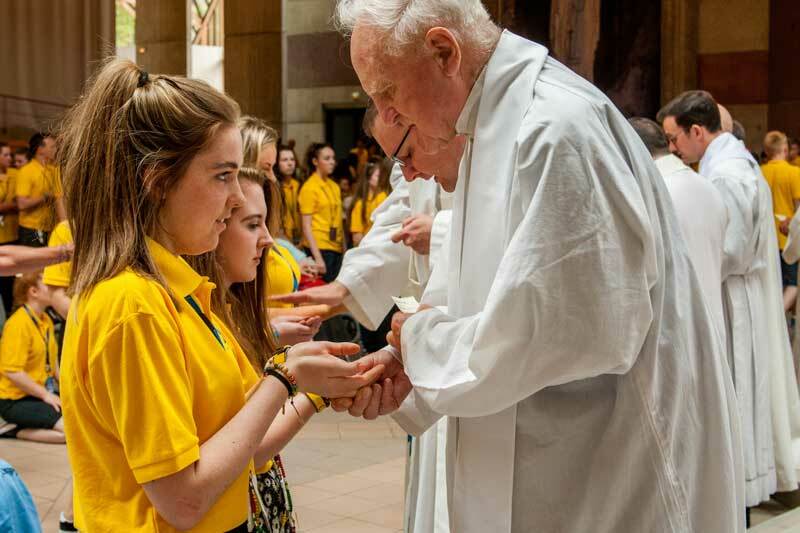 Youth pilgrims travel on a coach from 9 separate areas around the Diocese. You will stay in a hotel with your own coach. 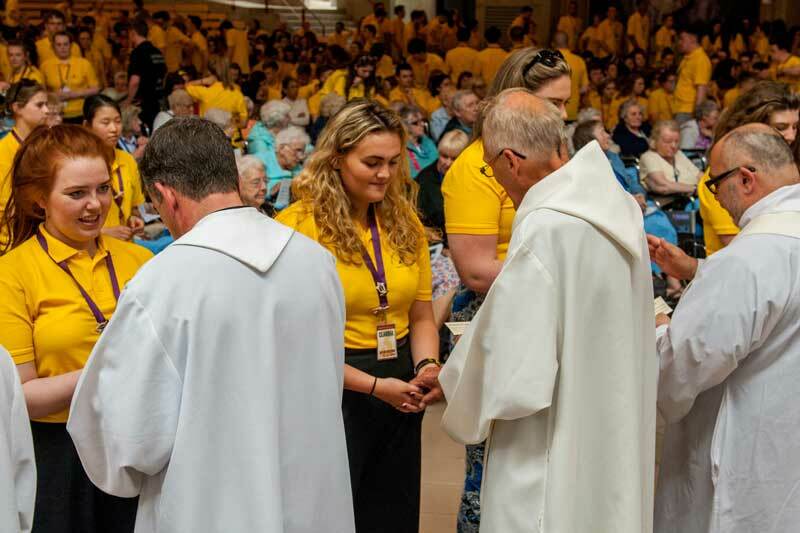 The main role of the youth pilgrim is to help our assisted pilgrims move from the St Frai and hotels to Masses and other services. 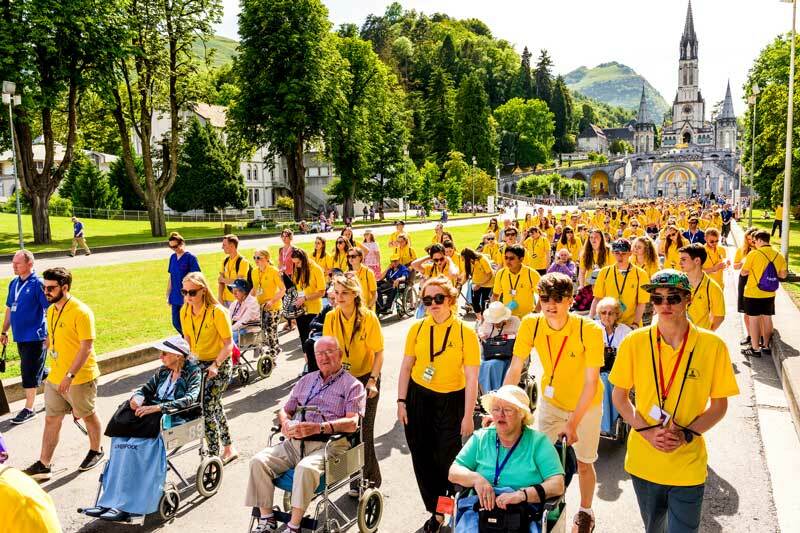 However, youth pilgrims also play a significant role in many other areas of the pilgrimage and you will see the yellow t shirts of the youth pilgrimage all around the town of Lourdes. 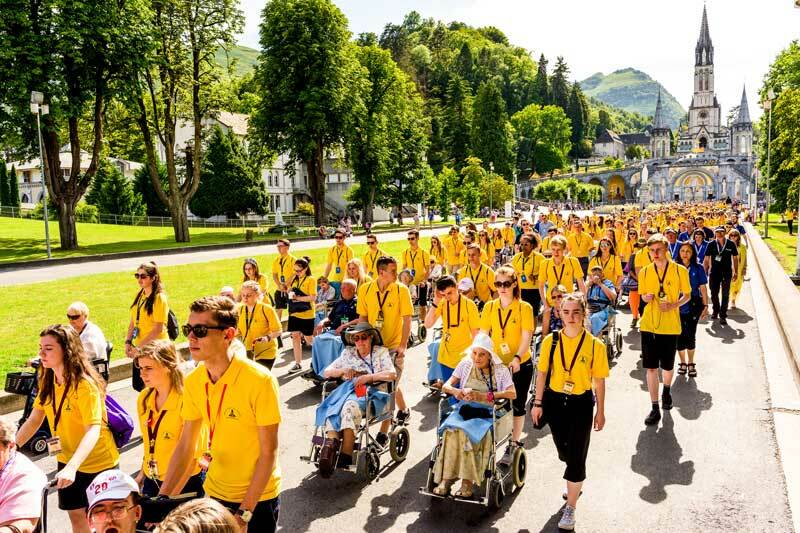 The different coaches that go to Lourdes will be allocated duties through the week and will know when and where to meet any assisted pilgrims, so any assisted pilgrim travelling to Lourdes will know there will always be someone there to assist them when the time comes for Mass, the Baths, the Blessed Sacrament Procession or the Torchlight Procession. 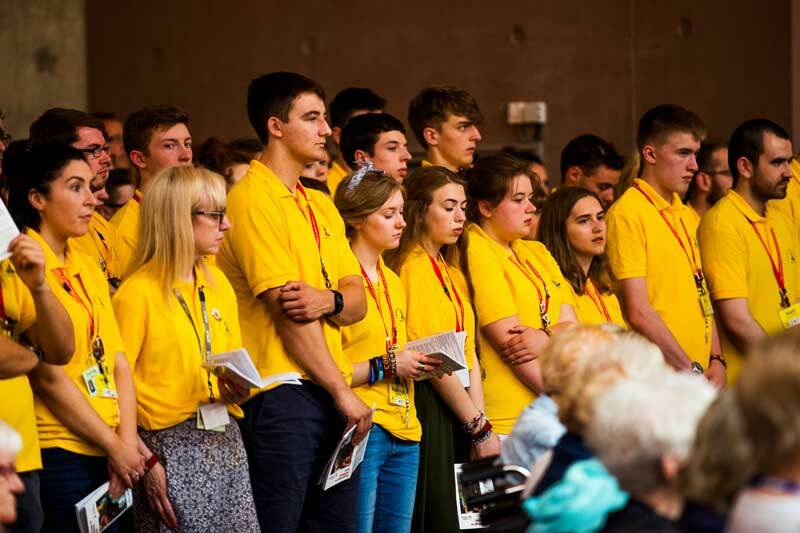 When youth pilgrims are not on duty they spend time with other members of the youth pilgrimage, especially their own coach group. They will pray together and have their own coach Mass. They will also have time to socialise and meet new people. Good listener and talker- these should go hand in hand! Not only listen to the pilgrim but also talk about yourself as they’d love to get to know you more. Cheerful – being happy yourself helps to make others happy. Respectful – for an operation as big as the Liverpool pilgrimage, it is important to listen to coach leaders so the process is a smooth one. That way there is no hassle and everyone is happy. Humility – you will be part of a very large pilgrimage and there will be times you might have to fit in with the plans of others rather than doing what you would prefer to do. Take pilgrims to and from Mass and the grotto. 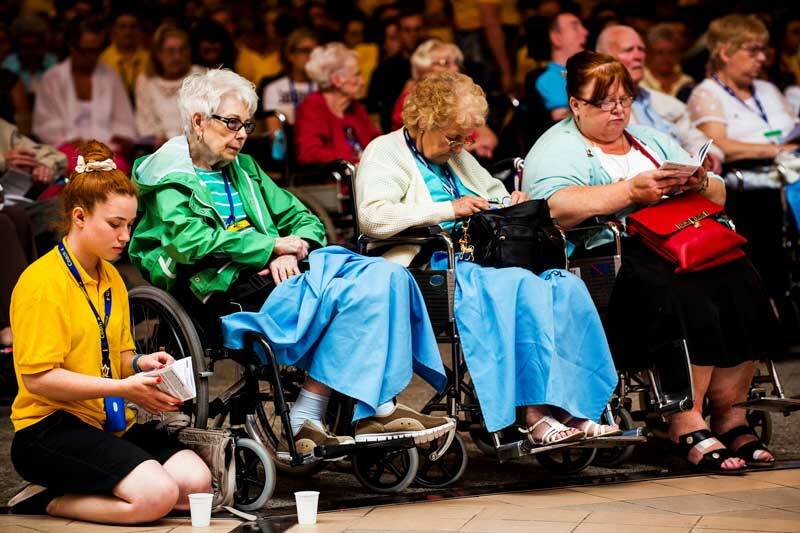 Assist in the leading of prayers with assisted pilgrims. Help out at the St. Frai (similar to a hospital) with cleaning surfaces, serving teas and coffees, taking pilgrims to meal times. Don’t worry – you’re just assisting and will never be asked to do anything which makes you feel uncomfortable! Taking out pilgrims for shopping or for a drink when they have some free time. Spend time with your own coach with times of prayer and reflection such as night prayer, reconciliation services, coach Masses. Enjoy social time with your own coach. When not on duty you are free to get ice creams or tea and coffee in the local cafes. Each coach has a day off and you will spend time with your own coach, and maybe meet other coaches, for day trips to nearby towns or the waterpark. When duties have finished for the day coaches meet in local cafes for social time with a chance for a sing-a-long or a simple chat with new and old friends.